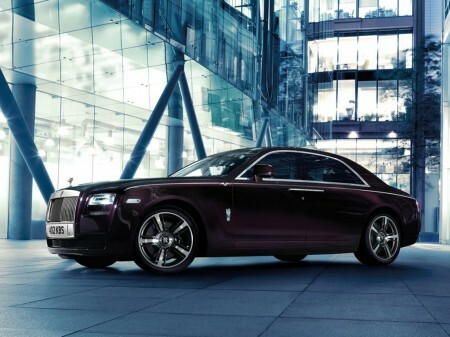 Rolls-Royce Motor Cars is delighted to announce the launch of Ghost V-Specification, a limited series of Ghost and Ghost Extended Wheelbase motor cars that will be available for customers to commission from January to June 2014. At the heart of the Ghost’s driving experience is its hallmark V12 engine. Acceleration is delivered with a characteristic immediacy and smoothness, propelling occupants from 0-60 mph in just 4.7 seconds with 80% of power available from idle. This unique powertrain is celebrated with a 30 bhp power increase on all Ghost V-Specification motor cars. V-Specification motif coachlines finish the exterior paint-scheme whilst customers can either choose from five specially selected exterior colors, or from Rolls-Royce’s 44,000 hue palette. Optional visible chrome exhausts and 21” part-polished wheels add further expression to the car’s dynamic promise. The V-Specification motif is echoed around the car’s handcrafted interior through engraving to the treadplates, embroidery to the rear armrest and hand-applied steel inlays to the front multimedia screen lid. The interior is completed with an exclusively designed clock with a black crown surrounding the face.